Disclaimer: This is a reminder! Information provided below is strictly meant for educational and entertainment purposes only. Please consult a financial professional before making any financial decisions. In May 2016, I wrote a post regarding my retirement account performance. In Oct 2015 time frame, I had moved my 401k money from my former employer to a Rollover IRA. The money was sitting as cash and I systematically started putting money into the market every time the market dipped. I followed the age based asset allocation rule of thumb where my bond allocation is equal to my age and the stock allocation is 100 minus my age. Basically I was targeting 40% bonds and 60% stock allocation in my portfolio. Below is a quick view of my targeted retirement asset allocation. To learn more on why I chose these funds and how I came up with this asset allocation, please read my retirement asset allocation where I share my thought process in detail. Key things to note are that the ETFs I have chosen are all directly pegged to a market index, have low expense ratios and are passively managed. Given that each ETF is pegged to a standard benchmark, I am almost guaranteed the performance results of the underlying benchmark. Thanks to the Jan 2016 lows and the Brexit fears. I was able to take advantage of both situations and bought into the market during these dips. Then I posted an interim update in May 2016 where I highlighted that my Rollover IRA was showing a 7.99% YTD return in May 2016. In this post, I am going to provide you a full annual view of how my Rollover IRA performed. To keep things simple, all of the performance data for S&P 500 index and the ETFs were taken from a single source – courtesy Morningstar. For the calendar year 2016, the S&P 500 returned ~11.96% which includes dividend reinvestment. 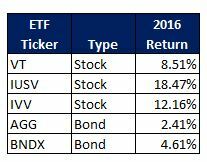 Now, let us take a look at how each ETF in my portfolio performed in 2016. The returns shown below assume that dividends were reinvested. Once again, all performance results were sourced from Morningstar. Now comes the fun part – how did my account do in calendar year 2016? It is going to be slightly different than what you see above given that I took advantage of the Jan 2016 lows and the Brexit fears during which time I moved all my cash into market. I spent quite a bit of time trying to get a performance snapshot from my brokerage to determine exactly how my portfolio performed in 2016 but I was unable to create that snapshot. I apologize that I am not able to show the exact CY 2016 results, however, what I have shown below is the results over the past 13 months. I am going to follow up with the brokerage to figure out how I can extract a statement for just the 2016 calendar year rather than looking at cumulative real time returns. What is more important to note is that my portfolio has provided a very decent return of ~18% during this period. #1 Stock returns have been phenomenally good. #2 Bond returns have been pitiful – it is a good thing that stock and bond returns don’t correlate. That is the whole point of asset allocation and diversification. #3 My portfolio has drifted from a targeted 40% bonds and 60% stocks asset allocation to 35.54% bonds and 64.46% stocks. A 4.46% drift has occurred from the targeted asset allocation. A portfolio drift could mean taking profits. When stocks go up and bonds fall, you take profits on the stocks and buy into the bonds. If bonds go up and stocks go down, you take the profits from the bonds and buy into the stocks. This aligns with the buy low & sell high, sell high and buy low cycle. What I plan to do now is to take some profits on the stocks and buy into the bonds so that the my overall asset allocation comes close to the targeted asset allocation of 40% bonds and 60% stocks. Re-balancing your portfolio helps you maximize your portfolio returns in a disciplined way. 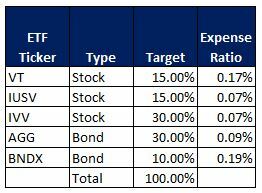 In the CY 2016, I re-balanced my portfolio once to maintain the 40% bond and 60% stock allocation. This would be the second time I will be re-balancing my portfolio. Given that my portfolio is in a tax deferred account, I can take profits without having to pay taxes. Now, that is sweet! I check my account periodically. Once I set the asset allocation in place with the above chosen ETFs, there has not been much effort on my part other than re-balancing my portfolio and taking profits periodically. I don’t pay attention to what Wall Street has to say, or what the Wall Street pundit’s opinions are, or get worried about which stock Bill Ackman is going to short next. No, I simply don’t care for any of these. The expense ratio for all my ETFs is below 0.20%. I don’t pay any financial advisory fees or the 1% to 2% many firms charge to manage a retirement account. Read this post to learn how much a 1% expense ratio can cost you. When my brokerage firm asked me if I need any help, I said, “Thanks, but no thanks!”. I did not have a clear picture of how to go about managing my retirement account on my own when I transferred money out of my former employer’s 401k plan where I had the money in a target date fund. The target date retirement fund’s performance was not great. Here is a post I would suggest that you read on what you should know about target date funds. So, I decided to take the matter into my own hands. I spent a lot of time studying asset allocation and wrote an entire series of blog posts on asset allocation last year. I implemented what I wrote in the blog post series. Well, my efforts paid off. The investment returns speak for themselves. I sleep well at night and don’t worry about what might happen to my investments should there be a correction, recession, or if somebody sneezes in Wall Street. Your retirement savings is probably your single largest asset. Do you know your asset allocation? How are you managing your retirement account? Are you a DIY type or do you rely on a financial advisor? How did your retirement account perform in 2016? What steps are you taking to ensure that your retirement savings and investment are aligning with your retirement goals? If you enjoyed reading this post, you might want to consider reading five things to consider for retirement planning. Great job on the performance of your investments and in explaining your process, Michael! We’ve been re-balancing, too, and we’re also keeping a 40/60 bond to stock portfolio for now. We’re following the Kitces/Pfau glidepath strategy which has us being more conservative in the first few years of retirement. In 2016 we just about matched the S&P 500 with app. an 11% return. Thank you, Mrs. Groovy! My asset allocation and portfolio re-balancing have been strictly by the book and it has produced good returns. It is great that your asset allocation helped achieve market results. What it the Kitces/Pfau glidepath strategy? I would like to look into it. 100% equity? Wow you are a brave man MSM! :) You have got me curious. May be, we can discuss asset allocation next time we chat. Excellent performance! Although I’d be way too chicken to put so much in stocks. We are lucky that our main retirement account (Rick’s firefighter pension) has a guaranteed ROI of 5% a year. Although it’s not a ton of money, it’s great for us as low risk tolerance people. I follow the good old asset allocation rule of thumb. My stock / bond allocation is fairly conservative.